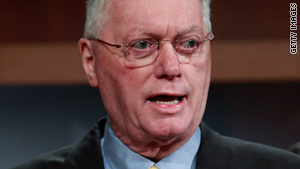 Rep. Jim Bunning says that if the benefits are so important, senators could find a way to fund them. Washington (CNN) -- The Senate adjourned Friday without approving extensions of cash and health insurance benefits for the unemployed after a lone senator blocked swift passage due to his insistence that Congress first pay for the $10 billion package. Retiring Sen. Jim Bunning, R-Kentucky, led a spirited Senate debate with Democrats over the issue -- at one time cursing at another senator on the floor. Bunning said he doesn't oppose extending the programs -- he just doesn't want to add to the deficit. According to two Democratic aides on the Senate floor Thursday night, Bunning muttered "tough s---" as Sen. Jeff Merkley, D-Oregon, criticized Bunning's stance on the package. An aide to Merkley said the senator didn't hear the remark. A spokesman for Bunning said he was aware of the reports about the senator's language but didn't have a comment. On Friday, Sen. Barbara Boxer, D-California, sent Bunning a letter asking him to "stand down immediately" from his stance. "Unemployment insurance is a lifeline to the long-term unemployed whose families have been hit very hard by this recession," she said. For his part, Bunning maintained on Friday that if all senators could agree that the benefits are so important, then they should find a way to pay for them. "If we can't find $10 billion somewhere for a bill that everybody in this body supports, we will never pay for anything," he said. Democrats argued the safety net funds are classified as "emergency" and therefore don't need to be offset. Starting Monday, the jobless will no longer be able to apply for federal unemployment benefits or the COBRA health insurance subsidy. With the Senate not in a position to vote on the extensions until next Tuesday at the earliest, senators and their staffs scrambled to determine the practical implication of letting the programs lapse -- even if for just a few days. In addition to funding unemployment insurance and the COBRA health insurance program for people who have lost their jobs, the bill would have prevented a scheduled 21 percent cut in Medicare payments to doctors. Those cuts will technically go into place when doctors' offices open Monday. But because there is a two-week delay processing Medicare payments, a short-term lapse of the program is unlikely to affect payments, according to experts in the medical community and a Senate Finance Committee aide contacted by CNN. Likewise, unemployment benefits could be delayed -- but if Congress acts next week, they will probably be minor, according to a Labor Department analyst who spoke to CNN. That's because Congress will likely approve the funds retroactively to make up for the missing days. An aide to Finance Committee Chairman Max Baucus confirmed the Senate will try to pass the funds retroactively. Other programs involving federal flood insurance, satellite TV licensing, and small business loans, will also go dark until Congress passes extensions.